With the ever rising cost of fuel, energy conservation is no longer optional. A leader in sustainable design practices, EI Associates enjoys the challenge of identifying and implementing Energy Conservation Measures (ECM’s) on behalf of our clients. For an international corporation based in NJ, EI recently performed an energy study to identify ECM’s associated with a 2,000-ton Data Center and Office HVAC system. Our study evaluated several cooling options based on the introduction of a plate/frame heat exchanger located between the existing condenser water system and the existing chilled water system. Ideally, the heat exchanger would be capable of utilizing cold condenser water from the cooling towers as a way to produce chilled water without the need for mechanical cooling. Ultimately, EI developed a “free cooling” heat exchanger option (as a waterside economizer) in a series arrangement to the existing electrical centrifugal chillers (which were upgraded with variable speed chillers as part of this project). This series exchanger configuration (which can provide full cooling or pre-cooling to the chillers) increased the available hours of free cooling operation from 2,800 hours to approximately 5,000 hours. 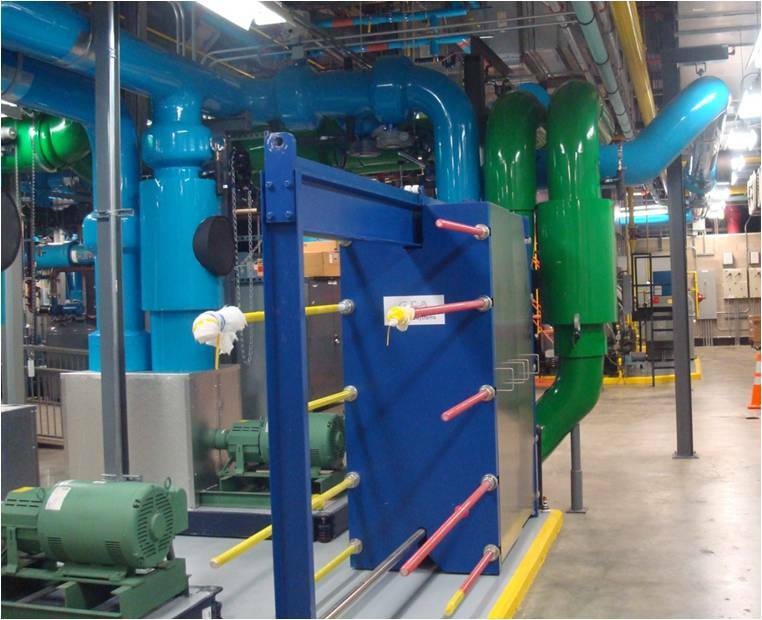 The proposed free cooling heat exchanger improvements were calculated to provide less than a 2 year ROI with anticipated energy savings of $260,000/year. Recently installed, EI provided all subsequent detailed design and construction administration phase services.